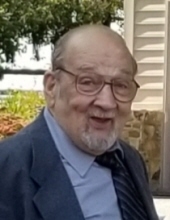 Celebrating the life of David Paul Kuren Sr.
Obituary for David Paul Kuren Sr.
David Paul Kuren, Sr., 76, of Newberry Twp., died Thursday, January 31, 2019, at Pinnacle Health Harrisburg Hospital. He retired as a Roofer for the former Ewing Roofing, Camp Hill and was a Vietnam era U.S. Army veteran. Dave loved horse racing, scratch-off tickets, and the Philadelphia Eagles. He also taught his boys to flirt and loved being with his children, grandchildren, great granddaughter and his nieces and nephews. He enjoyed singing Marty Robbins's song "El Paso" to the kids. Born on December 3, 1942, in Steelton, he was the son of the late Frank Sr. and Goldie (Garver) Kuren. He was preceded in death by a son, David P. Jr., two brothers, Frank Jr. and John and a sister, Carol Woomer. Surviving are his wife of 39 years, Connie L. (Barthel) Kuren; a son, Richard L. Roye of Monroe, ME; a daughter and her husband, Kimberly and Bill Wise of York Haven; two brothers, Tom Kuren of Harrisburg, and Raymond Kuren of Middletown; a sister, Barbara Kuren of Camp Hill; seven grandchildren, Terra, Melissa, William Jr., Zachary (Dana), Christopher, David, and Dalton; a great granddaughter, Janiyah; several nieces and nephews. In lieu of flowers, memorial contributions may be made to Penn State Cancer Institute (https://hmc.pennstatehealth.org/cancer-institute), 400 University Dr., Hershey, PA 17033. To send messages of condolence to family, please visit www.parthemore.com. To send flowers or a remembrance gift to the family of David Paul Kuren Sr., please visit our Tribute Store. "Email Address" would like to share the life celebration of David Paul Kuren Sr.. Click on the "link" to go to share a favorite memory or leave a condolence message for the family. © Parthemore Funeral Home & Cremation Services, Inc.